DUBLIN BUSES ARE driving past people waiting at bus stops at University College Dublin (UCD) late at night, according to students. Students have said this is a regular occurrence at stops on campus from around 10pm onwards. The campus has several bus stops and is served by routes including the 46a, the 11 and the 145. 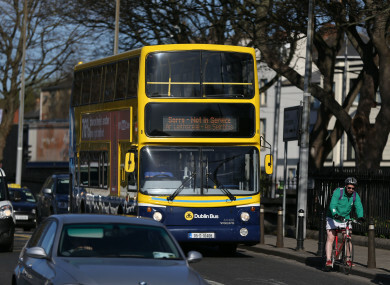 Complaints have been made by students to Dublin Bus and their Students’ Union about the issue over the past few years. UCD Students’ Union president Barry Murphy said security guards on campus have only witnessed one incident of anti-social behaviour during this period at the bus stops. Murphy claimed there was an incident where two students in wheelchairs waited 40 minutes for buses that didn’t stop outside UCD. The students allegedly had to pay between €80 and €100 to get a taxi home. A campaign will be launched by the SU to get buses to stop at UCD over the next fortnight. “From the NTA perspective, I am not quite sure why they cannot guarantee drivers will stop to complete a task they are being hired to do,” said Murphy. Dublin Bus tweeted on 31 January that the buses don’t stop due to “frequent anti social behaviour” at UCD bus stops. “The safety of our passengers and drivers have on numerous occasions been compromised by passengers boarding at that stop,” the tweet said. Dublin Bus did not respond with a comment in time for publication. UCD student Jade Wilson lives an hour from the university and has been frequently ignored by drivers on her way home. “Last night, five buses passed me by and I was waiting over 40 minutes. When the next 145 came, I was so desperate for them to stop that I walked out onto the road waving my arms at the driver. They blatantly ignore students,” said Wilson. “I hope the SU campaign makes a difference but it’s hard to feel real optimism considering this problem has been ongoing since before I even started my degree at UCD. Hey @dublinbusnews I’m a student at UCD & I commute an hour there and back. Wondering why I’m left *stranded* outside the campus right now at 11:30pm because every single bus just passes the campus by at this hour. I definitely can’t afford a taxi an hour home. This is atrocious. “I’ve filed a complaint with Dublin Bus and they’ve assured me they’ll look into the issue. Here’s hoping,” she said. UCD student Marcie O’Brien said she has not witnessed much anti-social behaviour at the UCD stops on her commute to college. “No one screaming or throwing things and no reason for a bus to skip a stop, especially with sober students there just looking for a bus to get home,” said O’Brien. Another UCD student Oisín Quinn lives close to the Belfield campus but knows many people commuting long distances who can’t afford to get a taxi home. “It’s really punishing for people who really need to get into town or live far away with multiple buses,” said Quinn. UCD Estates met with Dublin Bus management about the issue several weeks ago to try and resolve the issue, according to the UCDSU president. Email “Students say Dublin Buses are not stopping for them outside UCD at night ”. Feedback on “Students say Dublin Buses are not stopping for them outside UCD at night ”.